Wall Street should be worried. Traders and investors have been trying to adjust for Trump's tantrums since he took office. Lately, the tantrums are punishing Amazon investors. Trump, who hates Amazon's owner, Jeff Bezos, has seized onto a conspiracy of his own making; that Amazon is ripping off the U.S. Postal Service and billions of dollars are being wasted because of the company. Anyone bothering to look a little closer at Trump's hatred of Bezos, also knows that he owns The Washington Post, a publication Trump loathes! So far, Trump's attacks have wiped out billions of dollars of the company's stocks, which plunge every time Trump tweets about Amazon. Other tweets focusing on Donny's trade war with the world have been contributing to the instability that has rocked the stock market recently. Bloomberg reported that stocks are on track for their worst April since 1929. Remember what happened that year? You got it...the stock market collapsed. The fact that we have a president who recklessly attacks our own economy and his perceived enemies while claiming to help it, doesn't bode well for the stock market's future. 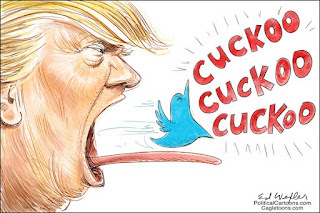 Particularly galling, is the fact we have a moron like Trump, whose twitter tantrums are a daily occurrence, playing with Americans investments. I'm no financial expert, or money pundit, but it's apparent to me that as long as Trump sits in that Oval Office governing by tweets, the stock market is going to be in for a long (and ugly) roller coaster ride.